Hubbell-Wiring 2-Pole 3-Wire Tamper-resistant straight blade receptacle in white color, has voltage rating of 125-Volts and current rating of 15-Amps. It withstands dielectric voltage rating of 2000-Volts. With back and side wired termination, this receptacle accommodates 14 - 10-AWG solid or stranded copper conductors. The 0.030-Inch brass contact ensures optimal conductivity. This self-grounding receptacle has features nylon top and base. This duplex commercial-specification grade receptacle comes in NEMA 5-15R configuration. It measures 1.569-Inch x 1.147-Inch x 3.28-Inch. This receptacle features tamper-resistant shutter mechanism that opens easily for the insertion of plugs while preventing entry by other small objects into either outlet slot. Receptacle has maximum load capacity of 1/2 hp. This flush mountable receptacle features 0.040-Inch galvanized steel strap for superior assembly security. It has stainless steel auto ground clip for longer consistent contact pressure. The zinc-plated steel screws mount the receptacle safely. It has 0.062-Inch steel-nickel-plated clamp that allows for easy external wire management. 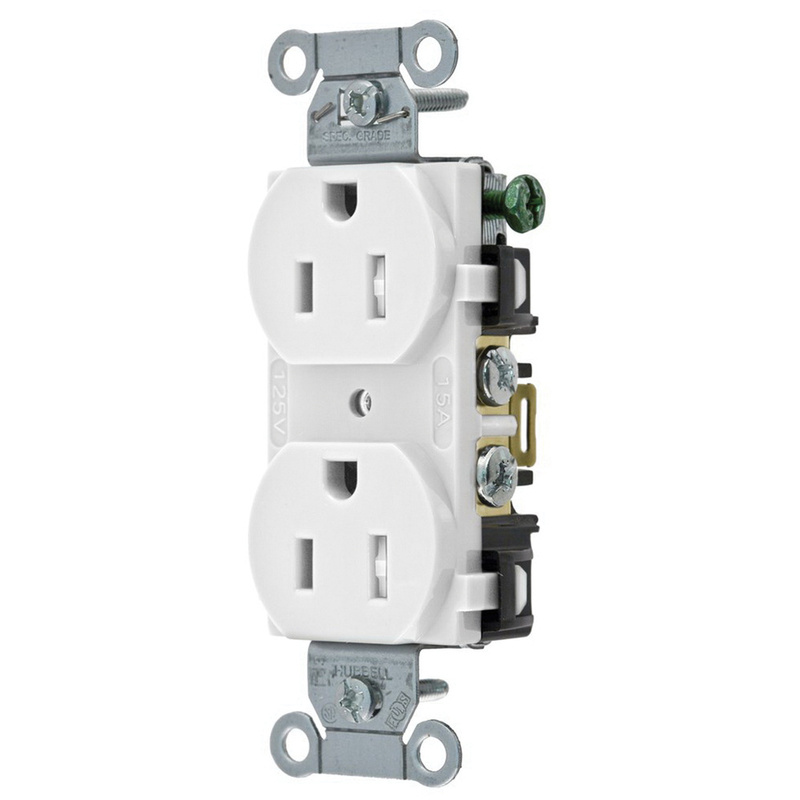 The #8-32 plated steel ensures better grounding of the receptacle. It withstands temperature range of -40 to 75 deg C. This receptacle has flammability rating of V2 per UL94 to withstand harsh environmental conditions. Receptacle is UL listed, CSA certified and meets WD-1 heavy-duty and WD-6 requirements.